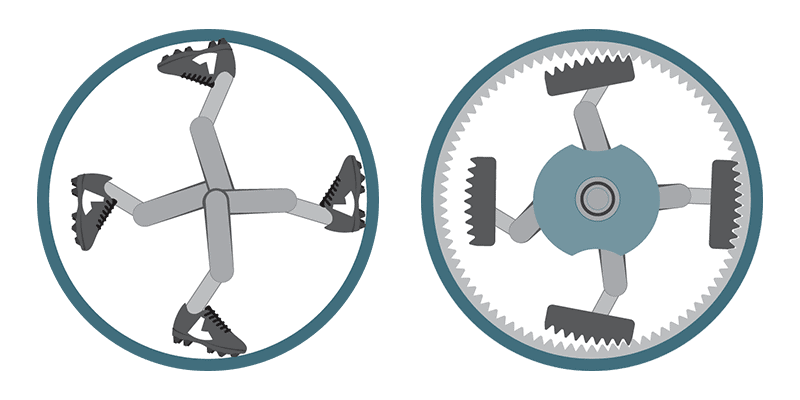 In the past 60 years, there have been no significant advances in robotic gear drive technology. The M-DRIVE was developed on principals of kinesiology and kinematics, the study of the human and non-human body movement. The innovative design simulates the motion of an athlete running, the pads and linkages emulated hips, legs, knees, and feet of a mechanical runner. Motion algorithms were created, modeled and applied to the M-DRIVE mechanism. The M-DRIVE ‘legs and feet’ replaced the age-old brute-force gear teeth with low-friction mating surfaces that act like cleated shoes running on the inside of a cylinder that won’t slip under pressure. A new method was applied to intelligently create and control the movement to maximize torque and minimize slippage and flexing. Later, a cam follower design and software tools were created to produce a perfectly optimized motion. The brains behind the Motus M-DRIVE is Carlos Hoefken, the CTO and Founder of Motus Labs. Carlos, a robot systems integrator, was frustrated with the cost and limitations of current gear drive technology. Carlos was determined to come up with a smarter solution. His determination led to many late nights, lots of tinkering and five years of dedication, resulting in a unique, breakthrough precision transmission architecture that has several, issued and pending U.S. and International patents. Motus Labs technology will change the face of the global robotics market. The M-DRIVE is a core technology in our high-precision, high performance, haptic robot. Positioned as the first personal robot, it gives arms and legs to the Internet of Things (IoT). Mind-blowing invention, a generational architecture that will be essential for decades.